Housed beneath protective hardened mineral glass lies the traditional white Railway dial as seen in train stations throughout Switzerland. Black stick hands and hour markers are off set by the much revered red lollipop second hand. 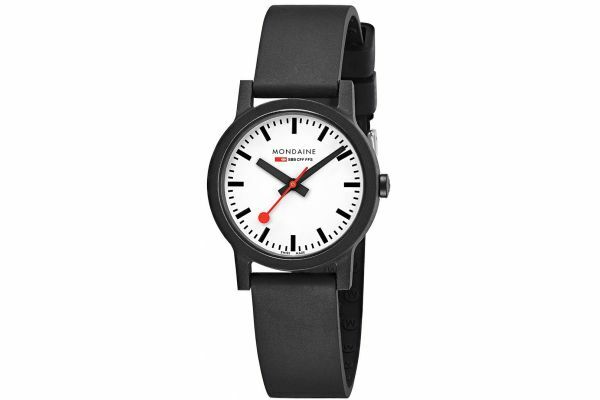 Set upon a black rubber strap which has been made from recycled materials and castor oil, the Essence watch is fastened by a secure black buckle. Powered by Swiss Quartz movement and water resistant up to 30 meters, this watch comes complete with a two year guarantee and official Mondaine packaging. The Essence watch is packaged with a recycled PET pouch. For us to size your new Mondaine Essence watch as accurately as possible, please take a look at our downloadable Watch Sizing Guide.